Z-lines are brakes. If you have them too tight bar pressure increases a lot and kite stops when fully sheeted in and kite backstalls. Sheeting out kite flies fast, in general behavior of kite becomes twitchy. To name this kind of setup some kind of camber adjustment is too simplistic. I am no keen on using the term "Brakes " for Z. Because it is a derivation from airplanes, paragliders and 4 lines power kites, all having no speed system to balance B and C : They have fixed A, B, and C bridles. Ths means that on a kite sheeting-in would drastically increase the camber, which will increase drag and "Brake" the wing (On the contrary depower kites keep the camber almost constant with bar stroke). These schematics are for "global understanding" ; they only apply if you have tension in Z actually , which is the most recurrent situations when driving average kite and/or at medium bar stroke. To be honest , I am not fan of slack Z when sheet-out because it will decrease the camber in the first cm of sheeting-in = slight loss of power when sheeting in, which is not logical. I see the self asserted e̶x̶p̶e̶r̶t̶ m.oron is at it again lol. sarcasm on/ Yes lets stroke his ego. Z is just for brakes and no camber adjustment is possible. /sarcasm off. Foilholio doesn't pansh use the same system of letters as flysurfer? ABC and Z? Yes but A main is just A, Front main is AXY etc . Last edited by RagingGrandpa on Fri Mar 16, 2018 3:33 pm, edited 1 time in total. Regis, you have a point there, Z line row in depowerable kite is more than just brakes. Foilholios simplistic way to tweak Z and his partially false explanation to earlier question got me writing a bit less precise than what I meant. It is not true however slack Z would give less power when sheeting in because of decreased camber. This is because AoA change is always the most important thing to power/depower kite and it always gets higher when sheeted in. Of course it is not reasonable to keep Z too slack - not any more than to keep them too tight. Haha, cocky words from a guy who just tweaks mixers and thinks it is some kind of very relevant thing to foilkites No foilholio, it is just fine tuning or in some poorly designed kites perhaps a bit more useful. In practice to tweak mixer for the conditions is for racers, in normal kiting it is just waste of time and very possible only gets kite worse. BTW how many foil kites have you foilholio designed? I have now completed over 20, and used speed systems like in this thread since 2006 - and also many other systems and pulley ratios. And if there is someone who has worked with kites thousands of hours in last 15 years, who owns dozens of kites and has tested and used over 150 different kites, all possible types of them, almost all brands - why wouldn't we call him an expert? This is a kind of reversed system compared to kites. In kites neutral position is low AoA and then it is increased by sheeting in. PG's have their normal AoA relatively high for getting enough lift and having stability against front stall. Then for more speed AoA is decreased by shortening A's and B's like diagram shows. Compared to kites PG system is a bit crude, partially this is because of their larger size and many line rows. However latest high performance gliders have only A, B and Z line rows like Sonic Race and late Speed4dlx. It should be always remembered main reason for mixer is to make AoA change possible. Camber adjustment is an additional option which can be used if needed. I suggest we force ourselves to detail only technical remarks on this post and do not turn it to personal fight. This topic can be a good tooling box for foikite mixer settings if we focussed on kite speed systems rather than PG's (while very interesting I shall admit). For example Foilholio it would be great if you could share your experience on WAC line like on Flysurfers mixers (of ex speed 2 &3's). Tomorrow i'll try to built the table of pro and cons of more camber. @Kitexpert : let me rephrase my slack Z point : when sheeting in the AOA changes and is indeed a major contribution to power. 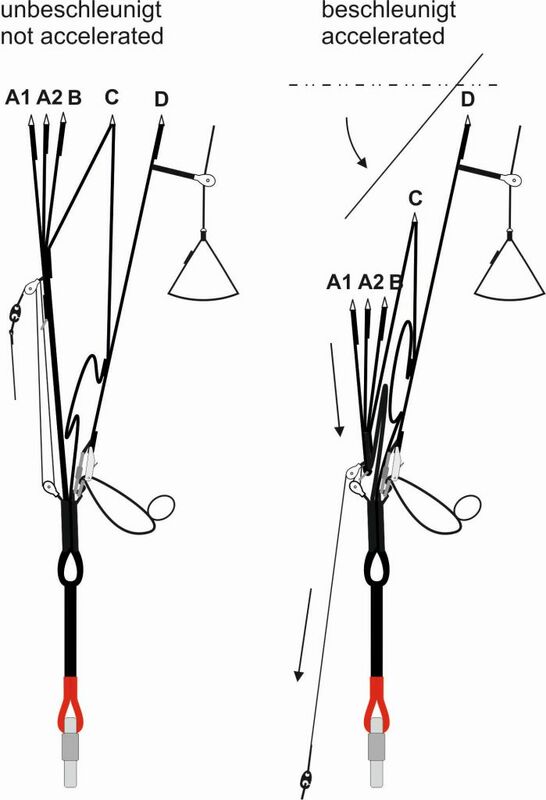 But for a same change of AoA (i.e bar stroke sheet-in from extreme depower position ) you may get less power increase if you start with slack lines (vs same operation with no slack Z) because the camber will decrease a bit in ths first centimeters of bar stroke. Regis-de-giens wrote: I suggest we force ourselves to detail only technical remarks on this post and do not turn it to personal fight. This topic can be a good tooling box for foikite mixer settings if we focussed on kite speed systems rather than PG's (while very interesting I shall admit). @Kitexpert : let me rephrase my slack Z point : indeed when sheeting in the AOA changes and is a major.contribution to power. But for a same change of AoA (i.e bar stroke sheet-in from extreme depower position ) you may get less power increase if you start with slack lines because the camber will decrease a bit. Like I wrote earlier I've flied (unintentionally) kite with no Z lines working at all. I was surprised how well it behaved and I think I'd remember if I had noticed strange phenomena kite losing power when sheeting in. But if you mean power is less increased compared to normal Z it is of course true but also trivial notice hardly worth further discussion. I don't think it is worth try to go back WAC or some other old systems. If they were useful enough we would see them in modern kites. Trend is to simplify, make shorter and less draggy bridles. Simple mixer 1:2:4 has been a standard for years, it is reasonable and it changes AoA without much or any camber change. BTW, have you Regis thought there is 30% - perhaps 50% - excessive bridle drag in Pulsion kites and also excessive weight of that line? If you give some measurements/ a picture of a kite I can demonstrate it there. I'm still puzzled I can't find a clear picture or even less line plan of that kite anywhere! In general it is best to try to keep mixer in default values like it was originally designed. For a designer perspective tweaking without a good reason is a bit annoying - if you want for example more efficient and less stable kite buy one and not try to distort existing kite for something it isn't meant to be. Thank you Regis for trying to be diplomatic Arguing with a m.oron is getting tiresome, others will just have to work out the basis of his assertions are flawed. Arguing from authority sigh/lol. Yes WAC lines they simply change the ratio of the mixer for part of it's range. They allow the use of lower cambers when more depowered and higher when powered. If you think of them in terms of a car gear box they are like having another gear. The negative to them is they increase bar pressure by pulling on A through B. Why I may have explained Z in simple terms:-) what other way is better?lol But I haven't yet explained B and C! B and C are very similar in a way and similar to Z also in another way. B, C and Z all engage the part of the wing preceding them. If you were to solely engage one of BC or Z, ie have it tight and the others slack, you would find B makes the least power, followed by C making more and Z the most. It's all to do with the amount of wing area between A and B or A and C or A and Z, (but also the camber). Now the big difference between BC vs Z is camber, pulling on B or C or both will create negative camber or reflex which in turn with torque the kite backwards pitching it up, back into the window with more tension on the bridles, ie more stable , Z does the opposite Now of B and C I believe B may make the most torque backwards i.e. most stable but what it definitely does do is make the least power on the kite. This then gives the possibility that if you can control B alone you can have good control of the kite, by sheeting in and tightening B the kite will become more stable and sit back in the window but won't generate too much power. Bringing us to the mixer, thinking of the mixer in terms of something that just changes AOA is well stupid, naive, ill informed and well just dumb. The mixer's function is to assist in control of the kite. It has a number of problems to try and overcome, like make a kite manageable (stable) while depowered or somewhat depowered, make a kite have the best L/D (upwind, float), make a kite have maximum lift (power), make a kite have reverse flight( for relaunch and more). Amazingly or not it can solve all these problems in one package. The real problem the mixer has is that best solution for one problem is bad for another problem. A very stable mixer has poor lift, a high lift mixer has bad L/D, mixer that doesn't stall can't relaunch. Bringing us to B and why looking at the mixer just changing AOA is stupid. The mixer has the ability to only affect B before C or Z and B is the secret to stabilize a kite and make it more manageable. So you can have this sort of play between A and B long before C or Z enter the picture. This then forms most of your kite control A and B and nothing else. When Z or C become too tight they interfere with this and you get a kite that is harder to manage. When should then C and Z engage? well at the perfect spot somewhere before the kite starts to stall. Engaging more Z actually delays the stall more so things get interesting. In simple terms what you have is the mixer engage with B for a large part of it's range then suddenly C and Z engage together. If you have C engage too much before Z you loose some performance and some manageability and you could delay C till Z engages and maintain just the A and B relationship. Even more basically if after lengthening Z you find a kite not stable enough try lengthening C. Or if you find the performance loss from lengthening Z too much instead of lengthening Z try lengthening C. The important thing to observe on a foil when tuning it is when are the different bridle rows going tight and how much gap is there between them. If Z tightens before C you have higher lift less L/D. If C tightens before Z lower lift possible better L/D. If C and Z tighten before B = messed up kite. If C and or Z tighten long before stall = kite hard to manage and stability problems. This foilholio's block of text is a mess. There might be some correct things in it but don't have time or interest to filter them out. Good luck for those who will try it.